Being able to “see” what is going on and also have data decoded right in front of you allows you to quickly assess if something is working or not and also you can see if date makes sense or not. SPIDriver comes with Python module that you can install directly from Python’s pip package manager. Also there are plenty of examples to show you how to read and write to SPI Flash, communicate with SPI sensors or modules and also you should have no issues using it as ICSP. Awesome, right?! So are there any downsides? Well, yes and no, depends how you look at it. SPIDrivers biggest feature is also it’s biggest “downside”; the display. 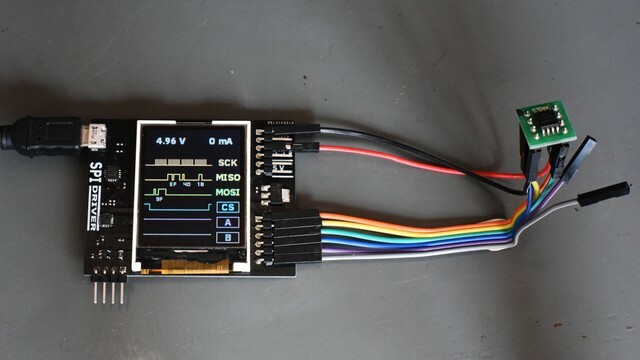 While it’s fantastic to quickly look at it and see what’s going on with the data going in and out of the SPI device, drawing it on the display takes time and this makes SPIDriver very slow when it comes to reading/writing large chunks of data. So for reading something like 4MB of flash or writing it to your ESP8266, you will need some patience because it’s going to take a while. However in my opinion, having that display makes it stand out and also provides additional ease-of-use for hobbyists and beginners, which is exactly what we need from open-source and open-hardware project like this. This should speed up the data transfer significantly. For example, if you are reading or writing large chunks of data you can disable screen update and enable it once it’s done. Reason being that you don’t need to keep updating the screen as often as if you were sending few bytes to try to read device ID. It would be fantastic to have an option to connect your device’s VCC to SPIDriver and it would translate 3V or 5V signals from SPIDriver to your devices, for example 1.8V rail. SPIDriver does not have any mounting holes. Now while that doesn’t functionally affect anything, it prevents you from laser cutting piece of acrylic and placing it on top of the display to prevent scratches or potentially damaging to the device. Now you could 3D print the enclosure for it but having mounting holes would still help.